This is the first game in the Mega Man X series. For other games in the series see the Mega Man X category. Mega Man X (ロックマンX, Rockman X?) 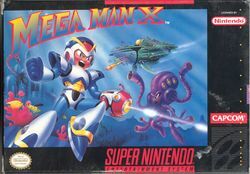 is the first Mega Man X series game released in 1993 by Capcom, featuring a whole new style of gameplay. The main difference between X and the normal Mega Man series is mobility, setting, and characters, in which Mega Man is given new abilities (like wall jumping) and partnered up with characters like Zero in a different time period. The game was released for the SNES first, and was then ported to MS-DOS in 1995. In 2006, a remake titled Mega Man Maverick Hunter X (イレギュラーハンターX, Irregular Hunter X?) (the game's pre-title screen says "Maverick Hunter X: The day of Σ") was released for the PSP. This version features additional voice over cutscenes, 3D graphics, hitbox and timing changes, auto-save, and a hard mode. Mega Man X was also re-released as part of the Mega Man X Collection for the GameCube and PlayStation 2 in 2006. A final remake with higher-resolution graphics was released for the Wii Virtual Console and iOS in 2011. It was later made available to the Wii U Virtual Console. Dr. Cain, an archaeologist searching in the year 21XX for fossil records relating to Mesozoic plant life, accidentally stumbles upon ruins of a robotics facility used by the great Dr. Thomas Light. Inside, Dr. Cain finds a capsule which contains a highly-advanced robot, Mega Man X, who had human-like intelligence and emotions. Dr. Cain was fascinated, and began to rebuild and study X. Several months later, he successfully develops the first "robot android" (or Reploid), which can act and think exactly like a human being. However, with free will some Reploids turned to crime. Such rogue Reploids were said to have "gone maverick" and were later referred to as Mavericks. Crimes escalated, and the government stepped in, and under the advice of Dr. Cain, formed an elite military police organization called the Maverick Hunters. The Hunters would capture or disable any Reploids that posed a danger to humans and protect humans at all costs. Dr. Cain designed a highly-sophisticated robot as the leader of the Maverick Hunters, named Sigma. He headed the force for three years before becoming a Maverick himself; he took many other hunters with him and then took over an island, driving out the humans living there. He believed humans were inferior to Reploids and started a mass extinction effort. Only one other hunter, the mysterious Zero, was willing to fight Sigma. X, ridden with guilt for being the basis of the rogue Reploids, also joined Zero's cause, and together they fight to stop Sigma. Mega Man Maverick X PSP cover. This page was last edited on 12 March 2019, at 23:59. This page has been accessed 288,114 times.